Evolution MotorSports continues to lead the Porsche performance aftermarket with new and innovative products for the 996 twin turbo models. 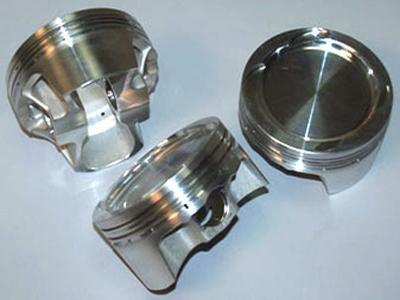 Our most recent product is a custom set of forged pistons w/ gapless rings. Evolution Motorsports Forged Pistons were engineered to replace the OEM pistons for increased strength and reliability. We engineered stronger ring lands with more material and upgraded the piston rings for increased strength and less leakage. We also “gusseted” the wristpin area and improved upon the overall strength for a true “bullet proof” piston. We have successfully pressure tested these pistons to over 1500 HP. The OEM pistons are good for most applications but failed this same pressure test at 800 HP. We have been utilizing these pistons in many street and race cars throughout the world with unbeatable results.